In the year 66 CE, the Jews in Roman Palestine rose up in revolt against the Roman occupation. Four years later , the Romans sacked Jerusalem, leveled the city, killed everyone inside, razed the Temple to the ground, and carted off the holy relics as spoils of war. As demonstrated in a BAR article by Louis H. Feldman, a hidden inscription on the Colosseum itself suggests that the construction of the amphitheater was financed by the plundered booty from the Jewish Revolt.b Vespasian faced a serious deficit when he became emperor, but the spoils of war from Judea—the riches of the Temple treasury, the golden vessels from the Temple, the seized personal treasures of Jewish citizens and the sale of the Jewish captives themselves—provided enormous wealth for the emperor and the plundering army commanded by his son Titus. Thus did the conquest of Judea fund the most recognizable structure of imperial Rome. These same plundered spoils of Judea are depicted prominently on another monument that still stands in Rome, which is the focus of exciting new research. The marble Arch of Titus was built in 81 C.E. by the emperor Domitian to commemorate the victory and triumphal parade of his brother Titus, the conquering army general, and Emperor Vespasian’s son and successor. In the most famous of the panels, Roman soldiers carry the Jerusalem Temple spoils on parade, including the menorah, the showbread table and trumpets, which were then deposited in Rome’s Temple of Peace. This panel and the others were recently subjected to high-resolution three-dimensional scans, resulting in stunningly crisp, high-quality images of the relief that are accurate within less than a millimeter and are free from the distracting visual distortions of the marble’s age and discoloration. 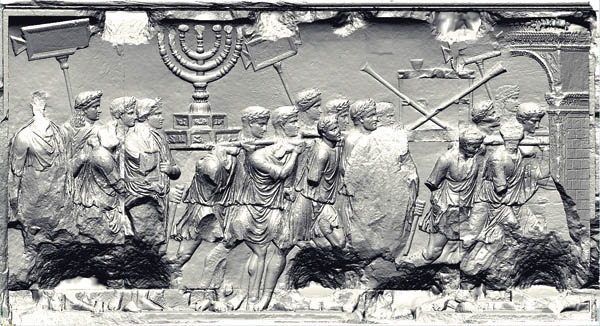 In the most famous of the panels, Roman soldiers carry the Jerusalem Temple spoils on parade, including the menorah, the showbread table and trumpets, which were then deposited in Rome’s Temple of Peace. 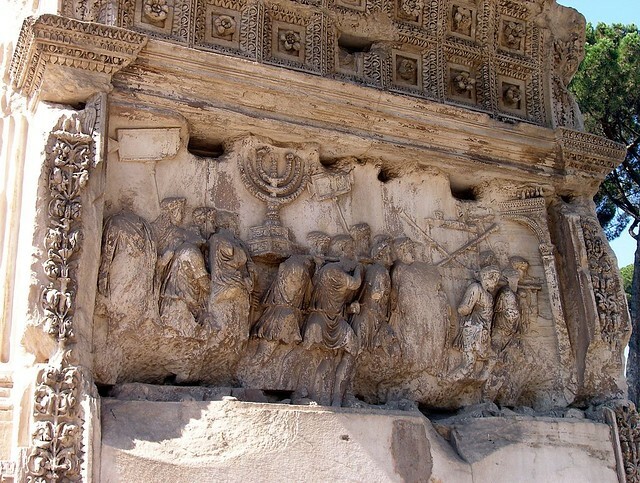 Courtesy Yeshiva University Arch of Titus Digital Restoration Project. Some people suggest that the relics were brought to the Vatican, where they still remain. I haven't seen any evidence for this claim, but it is at least possible. Do we have any information about what happened to these relics? Most likely, the menorah was looted by the Vandals in the sacking of Rome in 455 CE, and taken to their capital, Carthage. The Byzantine army under General Belisarius might have removed it in 533 and brought it to Constantinople. According to Procopius, it was carried through the streets of Constantinople during Belisarius' triumphal procession. Procopius adds that the object was later sent back to Jerusalem where there is no record of it, although it could have been destroyed when Jerusalem was pillaged by the Persians in 614. Not the answer you're looking for? Browse other questions tagged war ancient-rome roman-empire jews palestine or ask your own question. Did the Romans melt down looted golden objects or did they keep them intact? Did Josephus question the date of the destruction of the First or Second Temple? What happened to cities in the Western Roman empire after the fall of Rome? Was the wall of the Second Temple part of the fortification of Jerusalem? What happened to the imperial archives stored at the Tabularium? Where was the Temple of Onias located? How and when was the Temple of Trajan destroyed?